A member of the Columbus real estate community for 36 years (1976- present). After receiving a B.A. in political science with minors in history and real estate in 1976, Was orignally licensed as a sales person in Georgia in 1976, obtained his (Georgia Real Estate Institute) in 1978 and his CRB (Certified Residential Broker) designate in 1985. 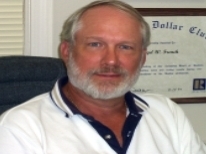 He taught Real Estate School for pre-licensing and continuing education for 22 years. In 1979 he earned his broker's license. In 1980, Mr. French was named in " Outstanding Young Men in America" and received the Better Homes and Gardens Achievement Award in relocation management. Licensed in the state of Alabama, and is currently a member of the Georgia Association of Realtors, Alabama Association of Realtors, Columbus Board of Realtors, Phenix City Board of Realtors, and National Association of Realtors. Served on multiple committees as well as on the Board of Directors for the Columbus Board of Realtors as a State and Local Director and served as the 3rd District GARPAC Trustee. Mr. French is native of Columbus and as a second generation real estate broker has extensive knowledge of the real estate market. His specialties include residential sales and leasing, commercial sales and leasing, as well as property management.